Embrace community. Serve others. Create culture. At A Cup of Common Wealth we embrace our community, we honor culture, and we stand for service. Community – A Cup of Common Wealth is committed in providing an environment to further the spirit and well-being of our artistically- and culturally-diverse community. This is the driving force of our business. We are dedicated to maintaining our opportunity to be a small piece of our thriving community of coffee lovers, coffee industry geeks, Midwesterners, Lexington residents, family, and friends. Service – Of course, we’re talking about the customer experience, but what else? We’re talking about service, in general. 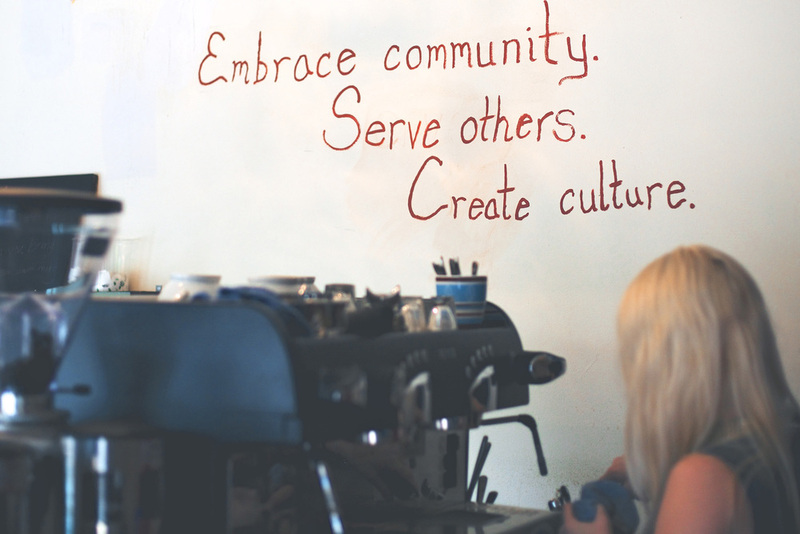 How can we be better servant baristas (heck – servant leaders) for our community-at-large? Sometimes, this may mean making the perfect coffee drink, but other times it may mean planting trees in the city park, hosting a poetry slam from emerging writers, or making our customers laugh over spilled milk. Culture – Such a heavy word, but it encompasses so much. When we think of culture we think of the coffee culture – that crazy dichotomy of serving an artisanal product, but coupled with a customer experience that is remembered days later. We think of a culture of community – it’s what we represent and what we celebrate; we also think of a culture of development – constantly assisting with the evolution and maturation of everyone and everything we touch every day. Ever since he was a little boy there was always coffee around Salvador. Coffee was a part of his parents’ daily morning ritual; there were few days that went by that they didn’t have a cup of coffee shortly after waking up. Though, his actual love for coffee came from two very communal and familial experiences. The first: every Saturday morning his parents would let any of their six kids have one cup of coffee if they wanted (in the beginning it was mostly milk, but as each child grew older the milk to coffee ratio changed quite a bit). Then they would spend the morning talking for hours as a family, sharing life. The second: the occasions when one of his grandmothers would visit. Both his maternal and paternal grandmother loved their coffee and both would sit with his parents and drink cup after cup. He would usually be able to steal some and listen to conversations thick with Spanish and nostalgic stories. The people, the experiences, and the community of coffee are what drew him in, but it remained a passion and hobby as he was trying to decide what he wanted to do in life. He always felt compelled to open a business and he loved the service industry, so he always imagined a restaurant or a bar. Then he got his first job and it was with coffee; naturally he added a third possible business into the mix. He may not have decided what he wanted to do, but he knew he wanted to open a business, so he began to save thanks to the advice from his parents. As he grew up he would become more and more intrigued with the coffee industry and paid attention to the rise of Starbucks and the Third Wave Coffee Movement shortly after. He eventually found his way into the doors of Water Street Coffee Joint. It is there he made up his mind to open a coffee shop. He fell in love with the business, the people in it, the industry it was a part of, and the culture they created. Still he knew he had to keep growing and preparing for a shop of his own someday. And, he saved. By the end of college, one of his closest friends and him began looking at cities to open a coffee shop in; Louisville, Detroit, Chicago, and different areas in Southwest Michigan kept popping up. Nothing felt completely right and they decided against it for the time being. So, he saved. He would then move to Texas where he worked for two different corporations, which helped round out his business acumen in national multi-unit operations, marketing, purchasing, merchandising, finance, human resources & talent brand, design & planning, and strategy. It also brought him more into the coffee industry’s circle and allowed him to network and grow his own coffee family. He saved some more. As more time passed, he became more steadfast in a dream: to create a business that was true to its mission day in and day out; a small company, but one that embraced its community, ensured service was top of mind, and had the ability to create a culture. Market research began and one city made more sense than any other one. A name was created that best fit the mission. He took the plunge and moved to Lexington, KY. Within a few months, they were ready to: Embrace community. Serve others. Create culture. A Cup of Common Wealth opened its bright blue door on July 1, 2013.